Peek Definition. (Alt + F12) You can browse through Visual Basic, C#, and C++ code definitions without opening a new document tab. 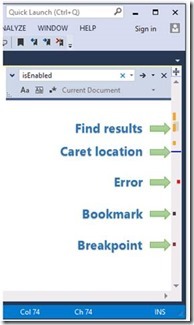 Enhanced Scroll Bar. You can set the scroll bar to indicate code markers such as errors, warnings, changes, and breakpoints. Navigate To. (Ctrl+,) : improvements include live result previewing and a streamlined inline UI experience. Auto Brace Complete The Auto brace complete feature automatically adds closing parenthesis, quotes, braces and brackets for you as you type code in the Editor. 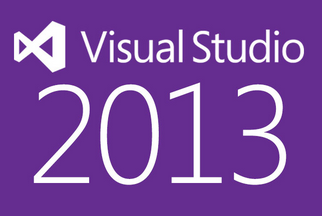 This was one of the popular Productivity Power Tools Features that we decided to include in the Visual Studio 2013. Move Line Up/ Down (Alt Arrow-Up/ Arrow-Down) Other new features include the ability to move a line or selection up or down by using hotkeys and auto brace completion.